ISS astronaut Steve Swanson was asked to play astronaut farmer; he is caring for a very small patch of red romaine lettuce orbiting the Earth. On May 7, he installed NASA's new Vegetable Production System (nicknamed "VEGGIE"), which had been sent up as part of a resupply SpaceX rocket launched on April 18. Over the past month, three of the six romaine plants in the chamber have sprouted and grown successfully, and Swanson is scheduled to harvest them in one week. He and the other astronauts in flight won't be eating these plants — they'll be frozen and sent back to Earth for testing to make sure they're safe. 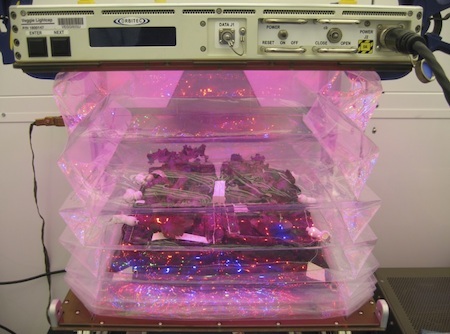 But if all goes as planned, the experiment will lead to subsequent batches of lettuce later this year, which would be the first food NASA has ever grown in space. Using lessons learned from the previous experiments about how plants grow in zero gravity, engineers from the private company Orbitec worked with NASA to develop the new foot-wide growth chamber. "Getting the environment exactly right for plants to grow in space is a challenge," says Gioia Massa, NASA's lead researcher on the project. The chamber includes bright red and blue LEDs (which are externally cooled to prevent the plants from overheating) and clear, flexible walls to trap humidity inside. At the bottom of VEGGIE is a mat — for the plants' roots to take hold in — with six small kevlar-lined plant "pillows" on top of it. Each of the pillows contains seeds, controlled-release fertilizer pellets, and a kitty litter-like clay mixture, designed to allow oxygen and water to reach the plants' roots as they grow. Science fiction fans are well aware of the potential uses for plants in space, thanks in part to engineer and sf writer George O. Smith. He created the idea of "Martian sawgrass" to provide oxygen in his 1942 story QRM - Interplanetary. Gregory Benford thought about lifezones, pod-like greenhouses that could be attached to the exterior of large space ships. 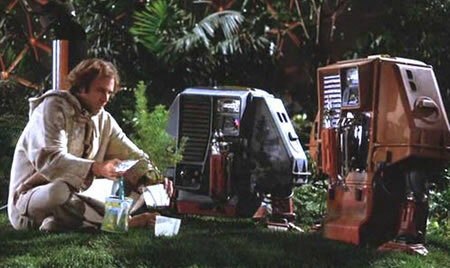 Fans of the 1972 movie Silent Running may recall that Bruce Dern took tended his garden with the help of robots. Why test vegetables grown in space? From Veggie Will Expand Fresh Food Production on Space Station .